Could this be the next Nissan Frontier? Nissan’s business partner, Renault, just debuted the production version of the Alaskan pickup. This comes a year after Renault teased us with the Alaskan Concept – a vehicle that certainly can be seen lurking in the Alaskan’s bodylines. Underneath, the Alaskan is based on the Nissan Navara NP300 pickup. This gives us a glimpse at what Nissan may have in store for the next U.S.-spec Frontier pickup. Speculation aside, the Alaskan is Renault’s first light duty pickup ever, making it a historic debut and rounding out Renault’s extensive line of commercial heavy vehicles. The Alaskan is advertised as a “one-tonne” pickup, meaning it can haul a metric tonne of weight in its bed. In U.S. terms, that’s 1.1 tons, or 2,205 pounds. That’s impressive considering the maximum payload for the 2016 Ford F-150 is 2,320 pounds. By comparison, the Chevrolet Colorado can only haul 1,630 pounds. 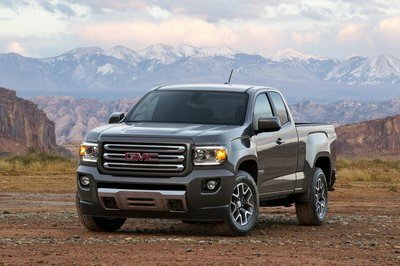 The Alaskan’s max tow rating is 7,716 pounds, falling in line with the Colorado but coming short of the F-150’s max tow rating of more than 10,000 pounds. The Alaskan does this with a fully boxed steel frame, a five-link rear suspension, and a 2.3-liter twin-turbocharged four-cylinder. That five-link rear suspension reminds us of Ram’s choice to ditch the old-school leaf springs. Renault’s press materials spurt some of the same benefits listed by Ram, including a smoother ride with less noise and vibrations. Single cab versions of the Alaskan still stick with the leaf spring design, however. The Alaskan will be built in Cuernavaca, Mexico; Barcelona, Spain; and Cordoba, Argentina. Sales will begin in Columbia, but will spread to several markets worldwide. 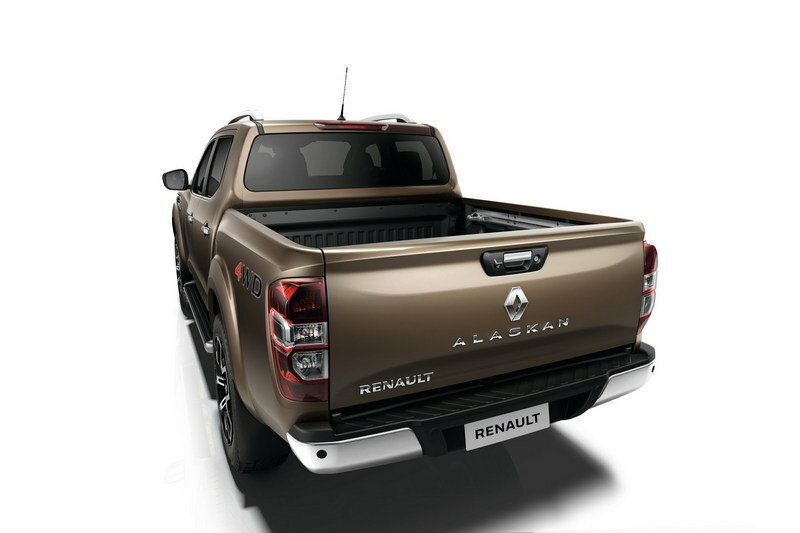 The Renault Alaskan is plainly a rebadged version of the Nissan Navara. Still, the truck has its own flair and personality, stopping it from being a dead clone of the Nissan. 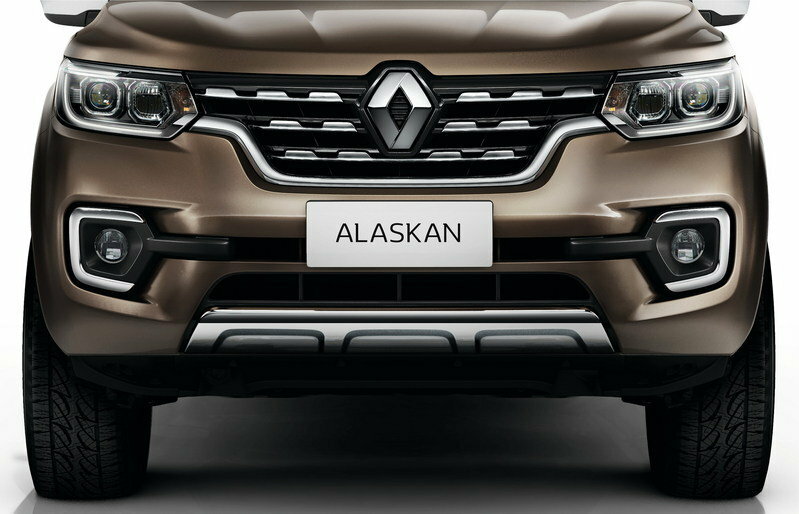 Up front, the Alaskan features a bold grille with horizontal inserts and a large Renault badge. Intricate headlights and chrome help give the truck a modern, bold look. 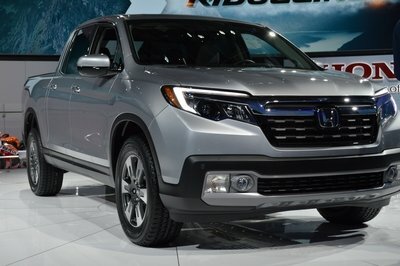 The front bumper is also designed with a rather impressive approach angle, helping the Alaskan traverse unfriendly terrain. The front bumper is also designed with a rather impressive approach angle, helping the Alaskan traverse unfriendly terrain. Around to the sides, the fenders bulge out like the shoulders of a body builder. The front fenders also sport a small grille, much like the Nissan Titan XD. Large fender flares and mud flaps keep the bodywork free from flying debris. Side steps make reaching the chromed roof rack easier. Out back, the bed features many of the innovative tie-down and cargo management tools from the Nissan Frontier and Navara pickups. There’s even a 12-volt power port back there. 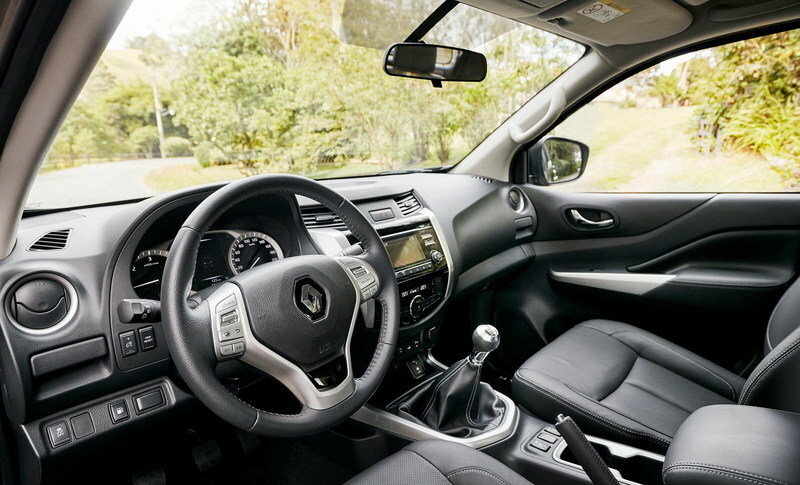 The Renault’s interior, like the exterior, recalls designs from the Nissan Navara. The overall design centers around the infotainment and HVAC system. The truck will come in both left- and right-hand drives, so the dashboard’s design is easily mirrored. The driver is greeted with two main analog gauges for engine and road speed. Two smaller gauges read fuel level and coolant temperature. There’s also a small driver information screen that shows a variety of information, including turn-by-turn directions. Atop the center stack is a shallow storage bin with a cleverly placed 12-volt power outlet. This is a fantastic place to plug radar detectors or dash cams. Down below the center stack resides another 12-volt power plug, switches for traction control, and the 4WD rotary knob. The Alaskan will come with a variety of engine options, though most are limited to various markets around the world. The main engine is the 2.3-liter, twin-turbocharged four-cylinder. It has two horsepower ratings of 160 and 190 horsepower. Torque specs haven’t been release yet. The two turbochargers are of the sequential kind, meaning the smaller turbo spools up quickly, sending boost to the engine rapidly. The larger turbo spools up more slowly, but sends a larger amount of boost into the intake manifold, generating more power. The Alaskan will come with a variety of engine options, though most are limited to various markets around the world. Two other engines are available, depending on the market. There’s a 2.5-liter gasoline four-cylinder with 160 horsepower and a 2.5-liter four-cylinder diesel making 160 or 190 horsepower. Though the horsepower specs are the same as the 2.3-liter, the 2.5-liter engine is a naturally aspirated diesel and is less sophisticated and slower to generate power. All three engines can be had with either a six-speed manual or a seven-speed automatic transmission. Both 2WD and 4WD are available as well. The Alaskan comes with both active and passive safety features. These include front airbags, ABS, Electronic Brake Distribution, Brake Assist, Electronic Stability Control, and Nissan’s 360-degree Around-view monitor. Prices have not been released as of this writing. Renault is expected to release the information closer to the Alaskan’s on-sale date. Still, that doesn’t stop us from speculating what Renault will charge. The Alaskan’s main competition in Australia is the Ford Ranger. It carries a starting price of roughly $35,000 U.S. dollars. Of course, adding options or selecting a higher trim line will push the price north. Loaded up, the Ranger Wildtrack can top $45,000. We’d expect the Alaskan to follow a similar pricing pattern. Ah the Ranger – the truck America no longer has yet is conspicuously missing from the action-packed midsize truck market. 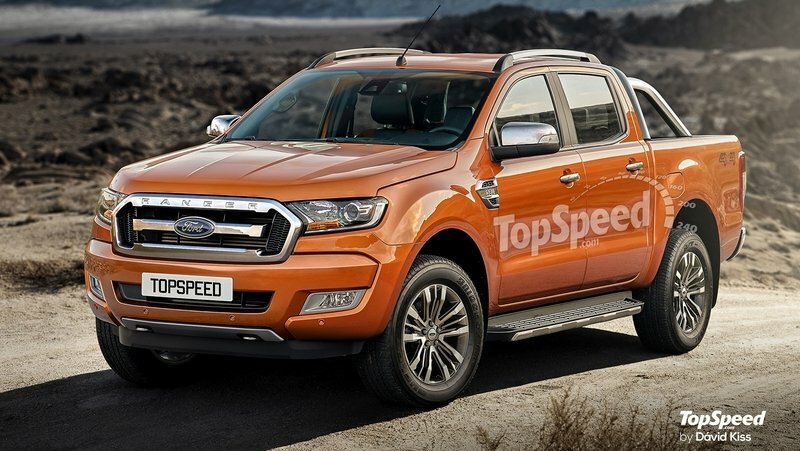 While Ford is reportedly bringing back the Ranger name on a midsize truck, the global version of the truck has been around for a while. It’s also the Alaskan’s main competition. The truck features a highly stylized exterior and interior, looking rather handsome. Its powertrain options include four- and five-cylinder diesels making between 158 and 197 horsepower and 284 and 347 pound-feet of torque. Both manual and automatic transmissions can be had, as well as 2WD and 4WD drivetrains. Read our full review on the Ford Ranger here. 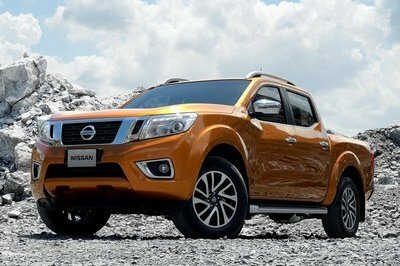 While the Renault Alaskan would technically be competing with the Toyota Hilux, if Nissan makes this is next Frontier pickup for the U.S., it will compete squarely with the hottest-selling mid-size in the market – the Tacoma. The Toyota Tacoma is less of a working man’s truck and more of an adventure rig. The Tacoma is offered in an extended and crew cab configuration with a four-cylinder and six-cylinder engine options. 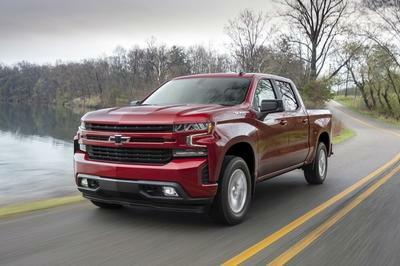 The vast majority of trucks come with the new 3.5-liter V-6. Technically superior to the 2.7-liter four-cylinder, the new V-6 features direct and port fuel injection, Otto and Atkinson combustion cycles, and variable valve timing on both the intake and exhaust sides. Horsepower and torque are rated at 278 and 265, respectively. Of course, both 2WD and 4WD are available. Optional terrain management system on 4WD models that helps drivers negotiate tough obstacles with ease. Prices for the 2016 Tacoma in the U.S. start at $24,500 and can near the $40,000 mark with all the options selected. 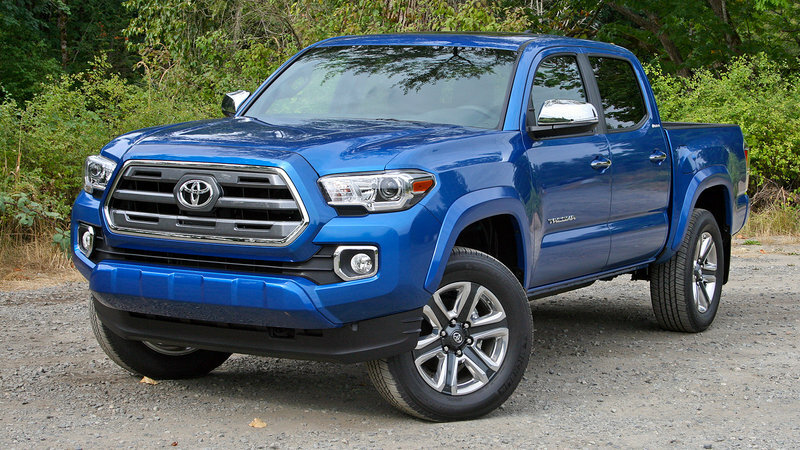 Read our full review on the 2016 Toyota Tacoma here. The 2017 Renault Alaskan is a tough-looking truck with a comprehensive list of features and available powertrain options. 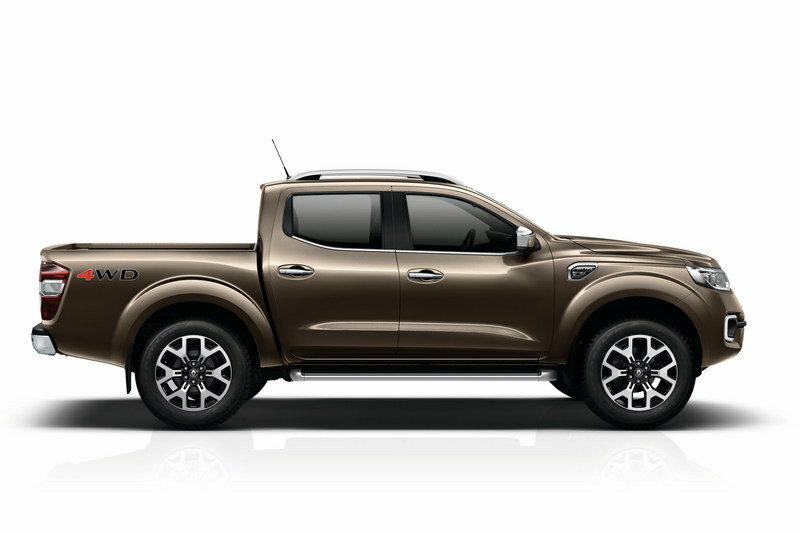 It takes the best attributes of the Nissan Navara NP300 and reshapes them into a Renault package. While we’ll never see the Alaskan on U.S. shores, it’s great to see this truck take shape. Not to mention the fact it likely foretells what the next generation of Nissan Frontier will look like – a truck we expect to see debut within the year. For Renault, the Alaskan is the next step in growing its already impressive line of LCVs, or light commercial vehicles. The Alaskan won’t be relegated to fleets, however, as it squarely competes with the Ranger for private sector dollars. It’ll be fun to watch what the future hold for Renault and the Alaskan. Renault takes the wraps off ALASKAN, a pick-up that takes a completely fresh approach to the segment, including a stunning design. 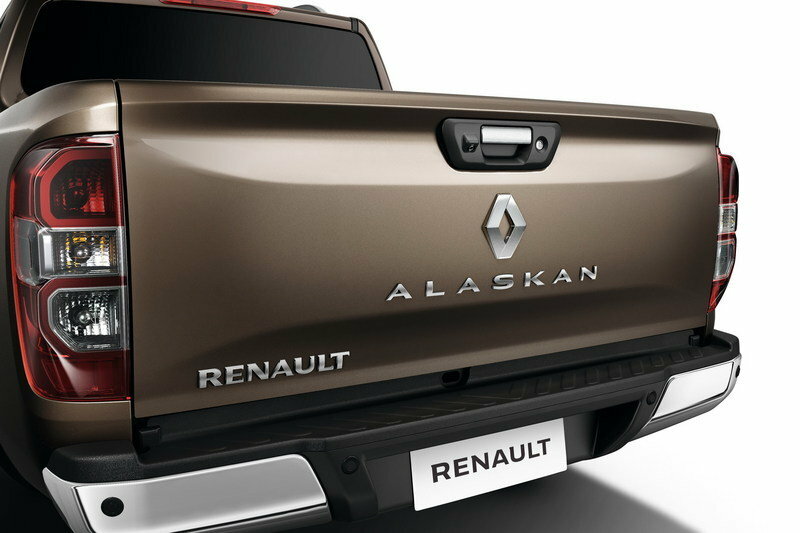 Renault enters the one-tonne pick-up market with ALASKAN beginning with Latin America. Renault builds on successful history in Latin America, a strong pick-up market, with global reveal and first market in Colombia. 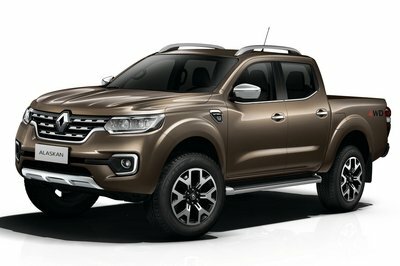 Medellin , Colombia - In a dramatic worldwide reveal surrounded by the rugged Colombian countryside, Groupe Renault today unveiled the Renault ALASKAN, a one-tonne pick-up with a stunning look leading with its forceful front-end. Both robust and comfortable, ALASKAN delivers exceptional driving comfort enhanced by a cutting-edge five-link rear suspension and a tough, fully boxed frame. 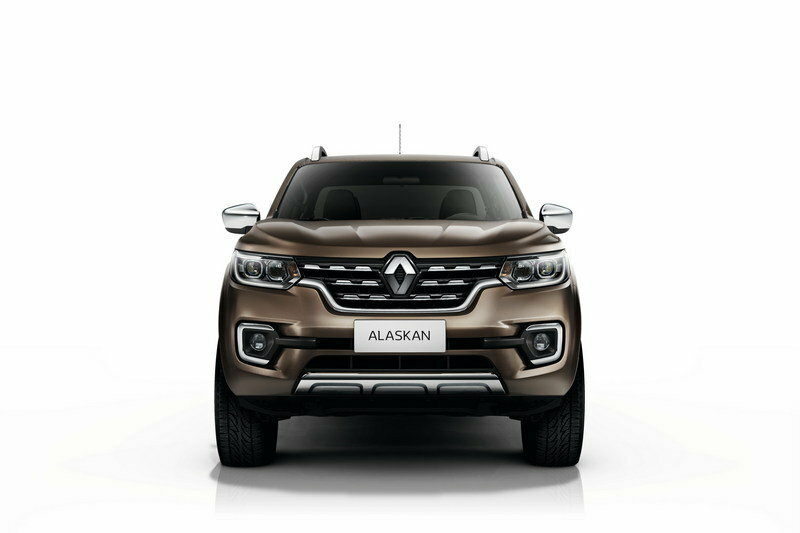 ALASKAN is a powerful, ingeniously designed vehicle which combines outstanding off-road ability with best-in-class fuel economy with the Renault 2.3-litre dCi engine under the boot. “ALASKAN’s design includes assertive dimensions and a visual impression of power and strength. It is the perfect companion for leisure use and everyday motoring,” said Laurens van den Acker, Groupe Renault SVP, corporate design. Renault is a major LCV player worldwide with 18 years of leadership in Europe and strong positions in many countries all over the world thanks to its wide range of vans and dedicated services. In September 2015, to address the needs of LCV customers more directly and clearly, Renault launched a global expert brand with a large panel of services dedicated to these customers: Renault Pro+. Through this expert brand, Renault will provide LCV customers with tailor-made products and services and a highly-trained specialist network.